A well-known large English "white" cherry - in practice the skin is predominantly flushed red over a white background. Merton Glory ripens towards the end of June in southern England. Please fill in the details below and we will let you know when Merton Glory cherry trees are back in stock. A white-fleshed cherry with an excellent flavour - a good alternative to Merton Glory if you only have space for 1 tree because it is self-fertile. Merton Glory is in flowering group 2. Merton Glory is self-sterile and needs to be pollinated by another tree of a different variety nearby. Like many traditional English cherries, Merton Glory is self-sterile and needs to be pollinated by another compatible cherry tree of a different variety. 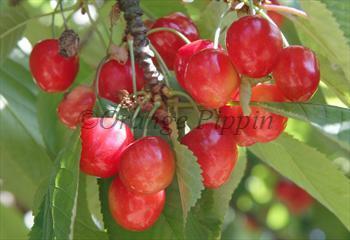 Most of the modern self-fertile cherries such as Stella are a good match. It is also able to pollinate the very early-flowering Early Rivers cherry, and is a good pollinator for most other early or mid-flowering cherry varieties. Developed by the John Innes Institute in the 1930s.